It’s often difficult to get a feel for the composer behind the baton, piano, writing desk or pile of fading sheet music. 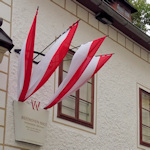 Vienna’s Beethoven Museum makes it easy. One of Beethoven’s most moving works was not a piece of music, but a letter: the Heiligenstädter Testament. In it, he raged against his growing deafness, his dark thoughts eventually giving way to a determination to continue creating and writing. He wrote that unsent missive in a house in a small country village (called Heiligenstadt) just outside of Vienna, where he spent the summer of 1802. There he also worked on, among other things, the Eroica variations (Op 35), his third symphony (Eroica – Op 55), and the Tempest sonata (Op 31 Nr 2). Heiligenstadt is now a city suburb, and that house is the Beethoven Museum. Probably. (It’s sometimes hard to be 100% certain of the exact address he stayed at when out in the country – computer records tend not to go back to 1802). (Re)opened in 2017, the museum features a wonderful collection of displays that bring the man and his music to life. The house (a former country bakery) surrounds a small courtyard and is split into six display areas, each no more than a room or two in size, their white walls and wooden floorboards adding to that air of authenticity. These are all just words. What you really get in just a short hour or two is Beethoven’s personality brought to life, through pictures, videos, book and journal excerpts, and much more. You won’t come out with an encyclopaedic knowledge of his career or output, but you should emerge with a (possibly sad) smile and a real understanding of Beethoven: man, genius, irascible artist, and legend. And, of course, there’s plenty of music to listen to along the way. …such a delightful mixture of revolutionary spirit, arrogance, and contempt. Genius, eh? I always get a kick out of every map or landscape drawing of the time. The Museum house was just a bakery on an empty country lane back then. Today, well, my kids went to Kindergarten in the house opposite. His little moan about the spa treatments he received. You can almost imagine the frown at each fresh mouthful of warm water. A lock of his hair (his actual hair). The accompanying display reveals how scientific tests on that hair tell a story of lead poisoning that likely proved one challenge too many for a liver already weakened by overindulgence. Headphones that let you experience the way Beethoven’s hearing deteriorated over time. The final video installation, which really brings home the extent of his lasting influence beyond the sphere of classical music, through references in modern music (Chuck Berry), literature (A Clockwork Orange), or politics (Bernstein conducted Beethoven’s 9th symphony at the 1989 concert celebrating the fall of the Berlin wall). Pop out into the garden, too, where you can sit in the shade of an apple or walnut tree and listen to the Septet in E-flat major, originally dedicated to Empress Maria Theresia. The shop is more extensive than for most of the musician sites in Vienna, with a range of Beethoven-flavoured souvenirs, books, CDs, postcards, and even Beethoven wine. Lockers are available for your bags and coats, but you need a €1 or €2 coin. Beethoven was inconsiderate enough to spend his summer retreats out in the actual country, rather than close to the city centre where subway stations would eventually be built. Shame on him. The 37A bus passes close by (get off at “Fernsprechamt Heiligenstadt” or “Armbrustergasse”) and you can catch that bus from the Heiligenstadt station, which is on the U4 subway line. Alternatively, take the 37 tram from the city centre (starts at “Schottentor”), then get off at “Hohe Warte” and walk down.